In this article, I introduce a series of tasks to use Blender, create a simple model and upload it to STLY for those who have no experience with modelling. This time, I explain how to set bones for the model you created. There are two ways to set bones, so I will explain them in two separate articles. 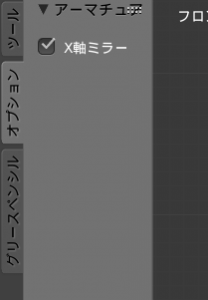 One is a way to set bones manually and the other is a way to use what is available in Blender by default. 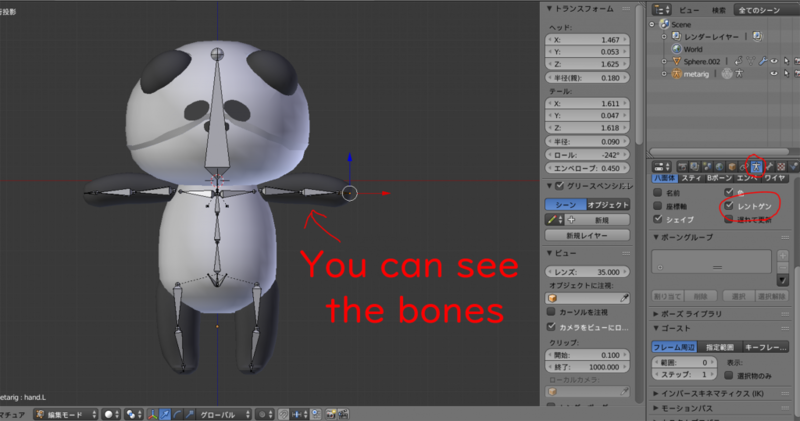 In this article, I explain the way to use the bone available in Blender. Please read the article below to learn how to set bones manually. Prepare a ‘humanoid’ 3D model. If each part is defined as a separate object, select all the objects and group them by ‘Ctrl+J’. All the mesh have been grouped. It’s a lovely panda, isn’t it? Press the ‘5’ key on Numpad to go to Orthographic View and press the ‘1’ key to go to Front View. If there is no Numpad, you can switch the view by the commands under ‘View’ on the bottom menu. In ‘User Preferences’, activate the add-on to use the bone (Rigify) available in Blender by default. Select ‘File > User Preferences…’ and click the add-on tab. Search for the add-on with the keyword, ‘rig’. 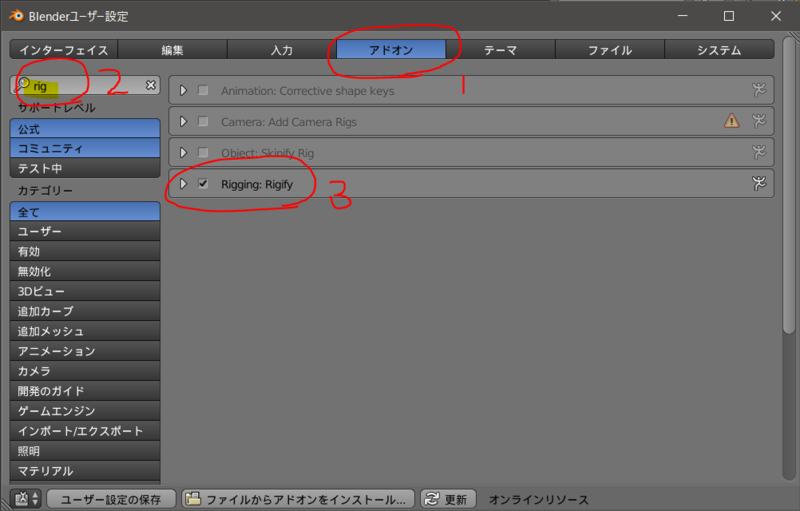 It should find ‘Rigging: Rigify‘, so check the box and press the ‘Save User Settings’ button. 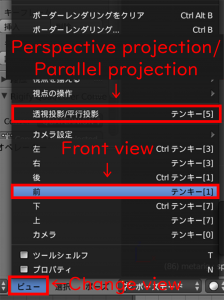 Go to the Wireframe view by pressing the ‘Z’ key. 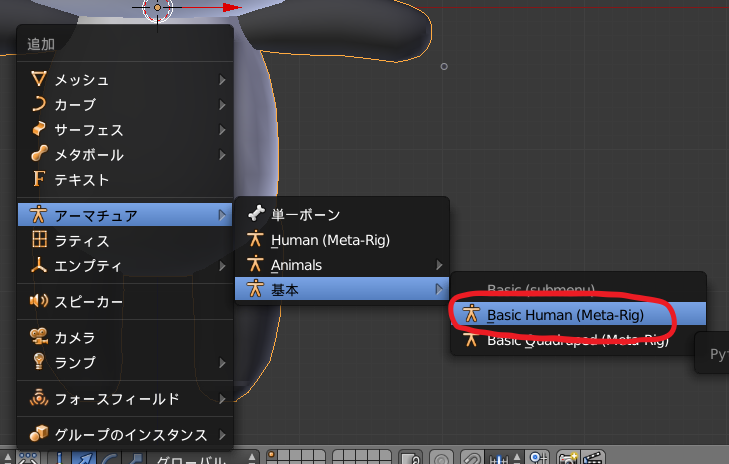 Then press ‘Shift+A’ and select ‘Armature > Basic > Basic Human’. It creates a complete armature. In the current state, you can see the bone only in the Wireframe display mode. Check the X-Ray box on the Armature tab in the right menu to make the bone visible even in the Solid display mode. Then, fit the bones to the body by scaling and etc. You can go into Edit Mode by pressing ‘Tab’ key with the bones selected, which allows you to select each bone. Fit them to the body by moving, rotating and scaling. When scaling a bone, select and move its tip instead of using the ‘S’ key. 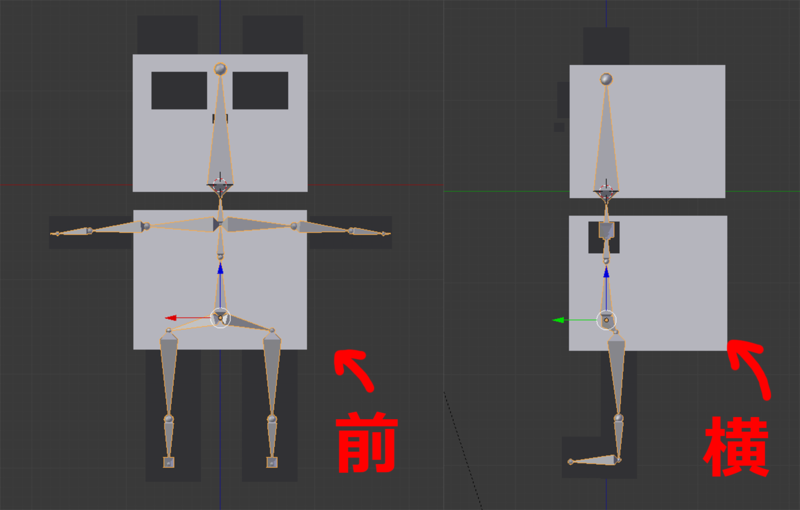 In addition, if you check the ‘X-Axis Mirror’ box on the ‘Options’ tab of the left menu, you can move the bones arranged symmetrically such as arms, legs, together. So, by moving one side, the other side moves accordingly. After fitting the bones to the model, select the mesh and the bones in order, press ‘Ctrl+P’ and select ‘With Automatic Weights’. Now the bones have been assigned to the mesh. Let’s check them. With the bones selected, press ‘Ctrl+Tab‘. The bones are now highlighted in light blue. This state is called ‘Pose Mode’. It’s the mode to set the pose as the name suggests. Select each bone and rotate it by the ‘R’ key. The arm follows the movement of the corresponding bone. When a bone is moved, the mesh associated with it moves accordingly. After testing it, move the bone back to the original position by ‘Ctrl+Z’. Check if all the bones move the corresponding parts correctly. The rigging task is completed if you didn’t find any problem. However… Look at the screenshot below. A part of the mesh stays still. Lovely panda’s mouth has not been associated (Sorry. It’s not very clear in the screenshot above). When the bones were assigned by ‘Automatic Weights’, some parts are left unlinked in most cases. That’s is to say, the mouth has not been assigned to the body correctly. 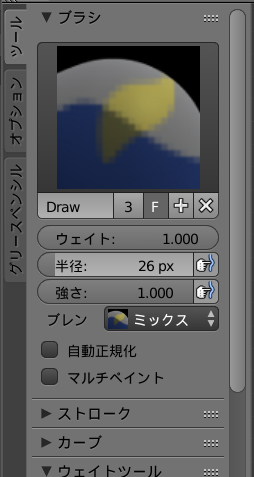 In this case, you need to use the function called ‘Weight Paint‘, which adjust ‘Bone Weights’. Now select the mesh and press ‘Ctrl+Tab‘. The mesh should be painted in some colours such as red, blue. This is the ‘Weight Paint’ function. The stronger the mesh is associated with the selected bone, the ‘hotter’ colour it’s painted in. Likewise, the weaker it’s associated with the bone, the ‘colder’ colour it’s painted in. 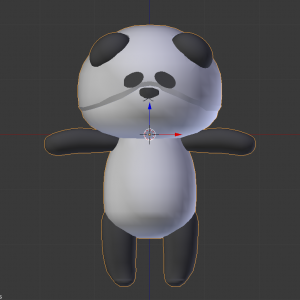 If you looked at the bone in panda’s head, you will find that only the mouth is coloured in blue, which means it’s not associated strongly. Let’s fix it. 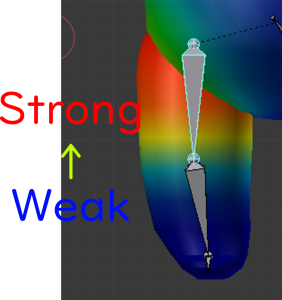 In this ‘Weight Paint’ mode, you can ‘paint’ the weights of the mesh. In this case, it seems to be good to paint the mouth, which is blue currently, in red. You can change the setting for painting in the left menu. The weight can be adjusted by the value of ‘Weight’. 1 means the strongest weight (red) while the weight gets weaker as the value gets closer to 0 (blue). Set the weight to 1 and paint the mouth. The mouth now follows the bone! Check if you adjusted the weight correctly as shown below. It’s done if you didn’t see any problems. The correction has been completed! This ‘Weight Paint’ could be painful to adjust. When you use the model with a large head, ‘Automatic Weights’ could associate the head with the bone of the arms. So, how correctly it’s painted depends on the shape of the model. In the next article, we will create an animation from here. 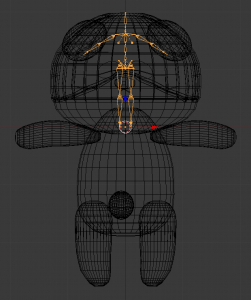 ・Pose Mode: The mode to move bones after assigning bones to the mesh. ・’Weight Paint’ mode: The mode to check and adjust which part of the mesh is associated with each bone after assigning bones to the mesh. 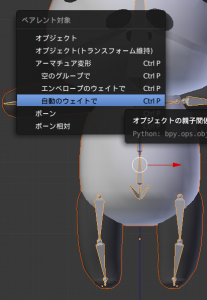 ・Ctrl+P: In this tutorial, it’s used to assign the bones to the mesh. 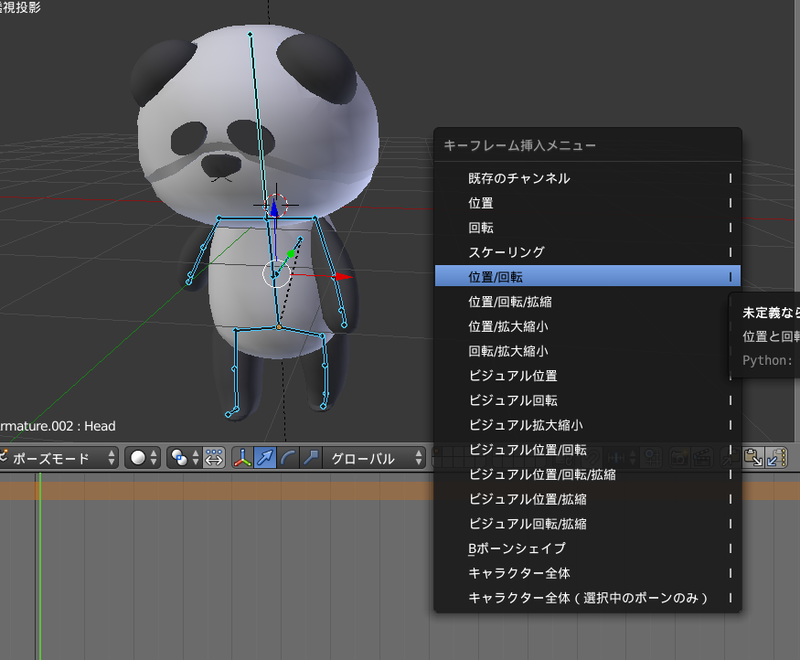 ・Ctrl+Tab: It sets to ‘Pose Mode’ when a bone is selected while it sets to ‘Weight Paint Mode’ when a mesh is selected.